This is something I drew last year as a gift for my sister. By that time I was making sketchbooks with drawings on the cover and she wanted one so I made this. In the end I quit making scketchbooks so she never got hers (I know, I'm terrible) but the piece is done and has been saved for many months, so why not share it. Drawn with pens and painted in Photoshop. Oh I love this style, gorgeous piece! I agree with the commenter below, very Rackham meets Ghibli! Did your sister at least get a print? 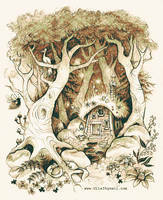 Very neat piece: it is reminiscent of Arthur Rackham, but also Ghibli studios. This is beautiful. It looks like an etching, which is very nice... I'm in love with the hatchures and the colour scheme. Great job! Good job, as always !!! Very interesting perspective work and scenery. Very cool job. I love this!!! It reminds me of and old picture book <3 very unique style and composition!!! !